A dazzling smile can speak volumes about your personality. Ironically, we are all scared to smile because our teeth are not as pearly white like those beautiful models featuring in toothpaste advertisements. You must have already tried using all those commercially available ‘whitening’ toothpastes and started expecting a miracle to happen. 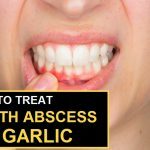 Well there is good news, you can actually get those beautiful white teeth you always wished for by using natural home remedies available in your pantry. Let us read to know here are some effective home remedies to whiten teeth fast. Have you ever wondered why your teeth is tad yellow than your favorite celebrities? The causes of tooth discoloration fall under two broad categories- extrinsic and intrinsic stains. Extrinsic stains occur on the surface of the enamel basically due to the kind of food we eat.Dark colored foods and beverages like grapes, pomegranates, blue berries, black tea, colas and dark sauces contain chromogens (pigment producing substance) that stick to the tooth enamel. Acidic foods and beverages not only erode the tooth enamel it makes it easy for the chromogens to stick to the enamel thus making it look yellow. Smoking and drinking alcohol are the main culprits behind yellowing teeth. Poor dental hygiene leads to dental plaque settling on your teeth, thus making it look yellow. Intrinsic stains occur within the tooth and it alters the light transmitting properties of the enamel and dentin. Some antibiotics that children usually have like tetracycline and doxycycline can turn the teeth brownish yellow. In adults, many mouthwashes containing chlorhexidine are culprits behind tooth discolouration. Antihistamines and blood pressure medications are also responsible for teeth staining. Acne fighting drug minocycline can also cause intrinsic staining. Fluoride ingestion and chemotherapy treatment of the head and neck can lead to teeth staining. Your genes and age also cause teeth staining. Some people are just born lucky with thick white enamel. For some the enamel is so thin that the naturally yellow dentine inside the teeth is clearly visible. However, with age the enamel starts becoming thin and thus the teeth appear yellow. 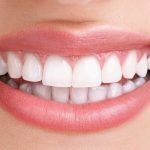 Here are 6 natural ingredients that can help to whiten your teeth. Baking soda or sodium bicarbonate can help to remove surface stains from teeth due its abrasive quality. If you have acidic mouth or eat a lot of acidic food then you should use baking soda which is alkaline in nature to balance out the pH level. You can blend baking soda with water or lemon juice before applying. Then wipe your teeth of extra saliva with paper towel. Apply this paste with your toothbrush evenly and leave it for one minute and rinse. If you are using water to make the paste then you can leave it for three minutes. Remember not to overdo this remedy. You can add a bit of hydrogen peroxide to this baking soda paste. This fruit is not only good for health it can also help you to achieve a confident smile. Rubbing the inside of a banana peel can make your teeth shine. Alternatively, you can use the inside of an orange peel. The three minerals potassium, manganese and magnesium do the magic. Mash a strawberry and blend it with baking soda and sea salt to create your own whitening toothpaste. The acidic quality of strawberry helps to whiten the teeth.Use this sparingly since overuse can corrode the enamel. Apply olive oil with a clean cloth or cotton swab and leave it for 2-3 minutes before brushing your teeth daily. Activated charcoal (reheated and oxidized version of charcoal) can help to remove stubborn stains and plaque from your teeth. Break 1-2 tablets of activated carbon and pour the powdered contents into a cup. Blend the powder with water to form a paste. Use just enough water to cover the bottom of the cup. Apply this paste on your teeth and leave for three minutes. Then rinse it off well. However, if your teeth are naturally dark or yellow you need to use stronger bleach like hydrogen peroxide or a dentist’s prescribed toothpaste. 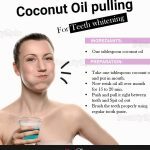 “Oil pulling” is a time-tested remedy for whitening your teeth. Lauric acid in coconut oil helps to get rid of the bacteria found in the plaque, protects gum health and keeps the breath fresh. Rub a little bit of coconut oil in your mouth for 10-15 minutes. Rinse it out and then brush. You can do this before your early morning brushing routine. Eating apple can help to keep your teeth white naturally. The malic acid in apples does the trick. Crunchy vegetables like celery, broccoli, cucumbers and carrots are great tooth whiteners. Rinse your teeth after eating to remove food residue that can stain your teeth. Raisins can work up the saliva that effectively removes plaque and prevents its build up. Daily brushing and flossing removes the stains between your teeth. Chewing sugar-free gum containing xylitol can prevent plaque, neutralizes your pH balance and increases saliva production. Wait for at least half an hour before brushing your teeth just after using baking soda or strawberry paste. 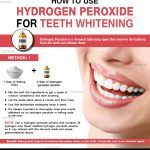 Whitening toothpastes are not a permanent solution for getting white teeth. Expensive cosmetic cures can give you instant results, but if you are a little patient and persevering then natural remedies will work wonders to give you the confidence to get the perfect ‘supermodel’ smile! You can actually get those beautiful white teeth by using natural home remedies. 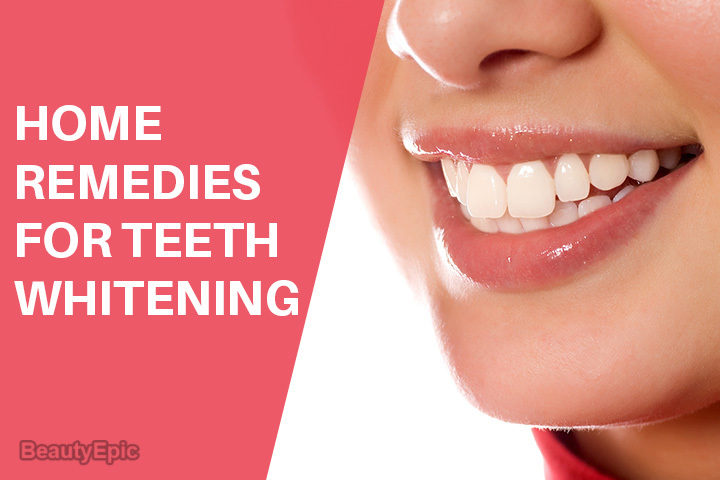 Here are some effective home remedies to whiten teeth fast.